​Our Volunteer Spotlight for Summer 2017 shines on Jim and Jackie Laurent! 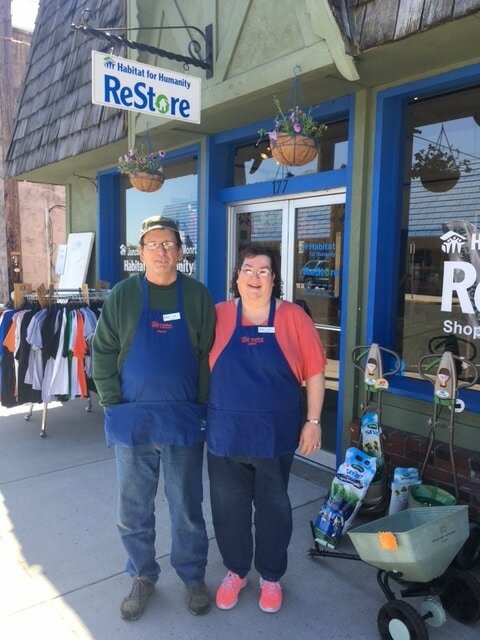 Jim and Jackie are new to Habitat for Humanity, but in a very short time have become integral to the success of our Habitat for Humanity ReStore. You may not always see Jim, as he's in the back of the store, processing donations--sorting, cleaning, and pricing the items you'll see on the sales floor. Jackie has a flair for DIY and has created much of our signage and is the inspiration for many of the projects that have been created using items from the ReStore. When they're not volunteering, these Junction City natives enjoy garage sales, road trips, and spending time at the beach with their two boys. Our Volunteer Spotlight for spring 2017 shines on Bob Czesnikowski! Bob, a long-time volunteer with Habitat for Humanity, has served as a Board Member, as a key member of the Construction Committee and Blues Build Benefit Committee, and, most recently, led the volunteer effort to establish our Habitat for Humanity ReStore. Bob has worked tirelessly to ensure that Junction City/Harrisburg/Monroe Habitat for Humanity will serve families in our area for years to come. To join us as a volunteer, contact us at 541-998-9548 or send us your interests on our contact form!